(Dark) grey with 5 narrow, vertical white bars (one is on the tail base), and a yellow tail. Usually in schools, but sometimes solitary. 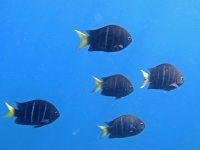 Unassessed by the IUCN Red list, a less common species of sergeant in the Indo-Pacific. Indo-Pacific; from the Eastern coast of Africa to Papua New Guinea and up to Japan. They prefer sheltered upper sections of drop-offs and rocky inshore reefs with moderate to strong wave action, in a depth range of 1-12 meters. They feed primarily on benthic algae.